Galeks-Agro is a model farm that implements the model of real ecosystems. Organic cultivation of crops and livestock is not only harmoniously combined, but also meets the standards of EU organic production. Organic farm Galeks-Agro means endless fields and neat meadows, is situated quite far from the industrial area, because of that the air is very fresh and clean. Such location is a prerequisite for organic production. The farm specializes in breeding cattle of meat and dairy Simmental breeds. Simmental breed is one of the oldest breeds in the world of combined areas of performance. 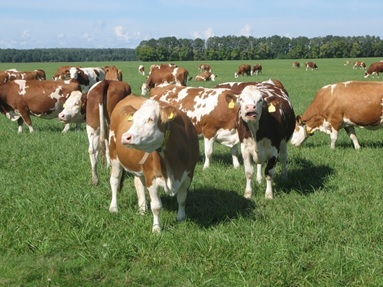 Main attributes of Simmental breed are high levels of meat and dairy animal performance. Adult cows of Simmental breed reach a weight of 650-700 kg and breeding bulls can weigh up to 1300 kg. Animals are characterized by high qualities of meat, they have a well-developed skeleton, adapted to any climate, resistant to stress. Calves are born with a live weight of 35-45 kg. They are well fattened, have a high growth rate. In 6 months the animals reach a live weight of 200-240 kg, which gives the opportunity to put them for rearing and fattening at an early age. Bull-calves under 12 months weighing 400-450 kg, under 18 months – 500-650 kg and have the average daily gain of 950-1200 g. Slaughter yield is 50-54% of young animals, 51-52% of adults. Homeland of Simmental breed is Switzerland. At organic farm Galeks-Agro calves under 4 months are fed exclusively with milk, cows have the opportunity to constantly move around the pastures, the animals are in natural conditions, move a lot and increase weight naturally. Growth hormones, food additives, and urea are not in any case added to the food. Because of these conditions the products has more vitamins, the meat has a wonderful flavor and texture of veins.